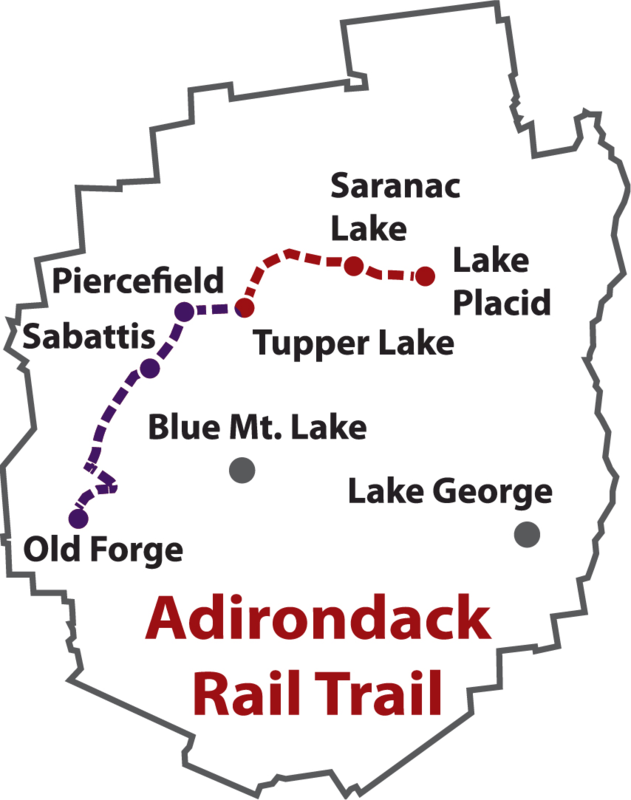 The Adirondack Rail Trail will offer a unique experience. Adirondack forests, mountains, lakes, rivers, villages, other attractions, clean air, cool summers and snowy winters represent the ideal setting for a recreational trail. People of all ages and abilities can experience our flora, fauna, geology, and communities intimately, needing nothing more than a sturdy pair of shoes or an inexpensive bike, and money for meals and lodging. It is reasonable to anticipate that the trail will attract as many users as any non-urban recreational trail in the U.S., particularly given the opportunity for winter snowmobile use and revenue. The money spent by users of the Adirondack Rail Trail will significantly benefit the economy of the region and make the region much more of a destination for outdoor recreation lovers, generating tax revenue that can be used to address other needs of the state and this region. Our hyposthetical journey will start in the iconic Village of Lake Placid, home to two winter Olympics, and a major tourist destination in its own right. The village is home to many restaurants, inss, hotels, and outdoor recreation opportunities. As your progress west and south from Lake Placid, you pass through the hamlet of Ray Brook with a famous barbeque pit restaurant, and a complex of State offices (APA, DEC, and State Police). At the 9 mile mark you enter the Village of Saranac Lake, the largest village in the Adirondacks, where there are numerous shops, restaurants, and historical sites. Leaving Saranac lake the scenery changes as the terrain becomes wilder, with lake crossings, wetlands, woods and open fields. not far from Saranac Lake you will pass through Lake Clear Junction, once the intersection of rail lines heading west (as we will) and north to Montreal. The old trail station still stands, next to a locally famous watering hole and restaurant. Skirting the southern shore of Lake Clear the rail trail next takes us to the Floodwood area where again we have opportunities to swim, fish, or picnic. At Rollins Pond we are a short detour into the Fish Creek Campsites, home to thousands of summer campers who take advantage of 380 State-maintained campsites. At this point we are only 9 miles from Tupper Lake and the Natural History Museum of the Adirondacks, better known as the Wild Center. This delightful museum has amenities for all ages, a cafeteria, and gift shop. Our super smooth bike surface will initially end here. For the remaining 56 miles the old railroad corridor passes through some of the most spectacular country in the U.S. The current plan from the DEC and DOT is to leave the tracks in place south of Tupper Lake and seek a responsible railroad operator to run an extended tourist service from Utica north. Currently the Adirondack Railway Preservation Society operates a regular summer-time tourist train from Utica to Remsen (Old Forge) with occassional service beyond to Big Moose. ARPS has expressed no interest in extending the run to Tupper Lake despite the State's plans. Rail-trail advocates are pressing for the conversion of this section as well if the State's plans cannot be fulfilled on a timely basis. In the interim, this section will continue to be available to snowmobilers in the winter.